I’ve shown a few concert shots, so before I start the next lot I thought I’d throw in a building to keep the architecture fans happy. This is a view of the Royal Concert Hall (which is where I saw the last concert), at the top of Buchanan Street. The road off to the left is Sauchiehall Street (see yesterday’s picture). 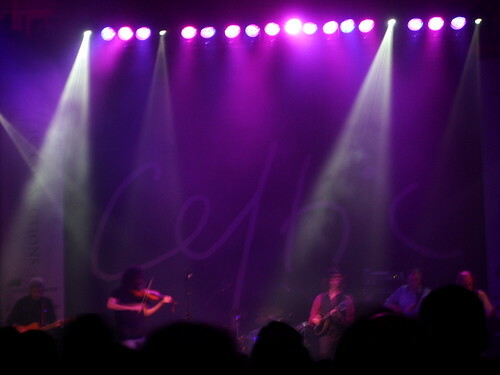 I have some more Celtic Connections photos to show, as thanks to a late Christmas present we were able to get to a cracking show last night (that’s why I haven’t done today’s entry on time – too knackered last night). I haven’t downloaded my photos so I’m not sure how many are any good yet, but hopefully I’ll have one or two. 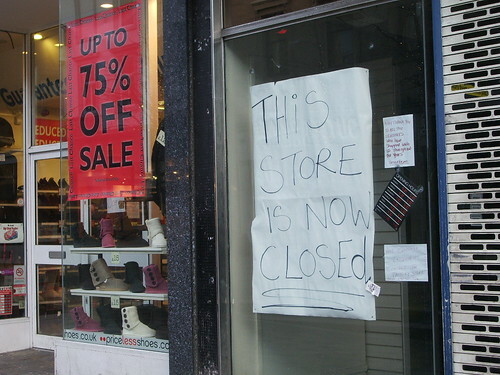 For now though here’s a picture from Sauchiehall Street. Pretty familiar I reckon. Before I came here I always thought Sauchiehall Street was *the* shopping street for Glasgow, but since I’ve been here the last 3 years I’ve noticed more and more pound shops and discount stores, especially down the pedestrianised end. This photo seems to sum up the current climate, sadly. Over the weekend the Homecoming Scotland campaign was launched. Coinciding with the 250th anniversary of the birth of Robert Burns, it’s supposed to celebrate Scottish culture (and, as An Honest Man pointed out yesterday, attract the tourists). Of course it’s already controversial – the campaign was thought up by the previous Lib-Lab administration, and now they are in opposition they’re accusing the SNP minority government of using it as a means of promoting themselves, which they deny (and of course, the previous lot would never have done that either, no of course not 😉 ). 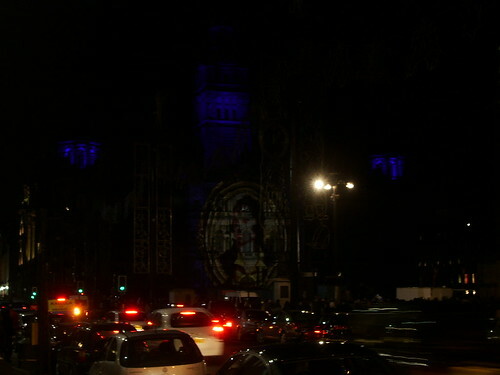 This was an event in George Square, where there was a stage with music, poetry and dancing, and these images of the Bard projected onto the City Chambers (NB there’s a much better photo than this one on Long Aye-lander‘s blog). 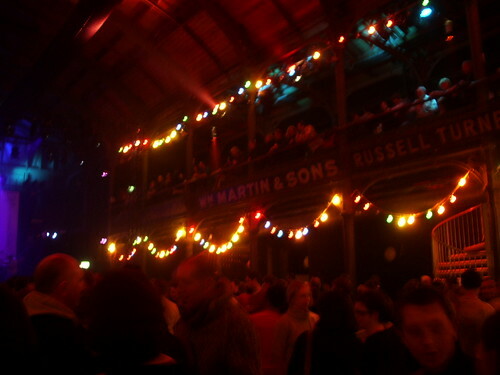 Here’s a view away from the stage at the Old Fruitmarket. I think this is such a fantastic venue, I love coming to gigs here. 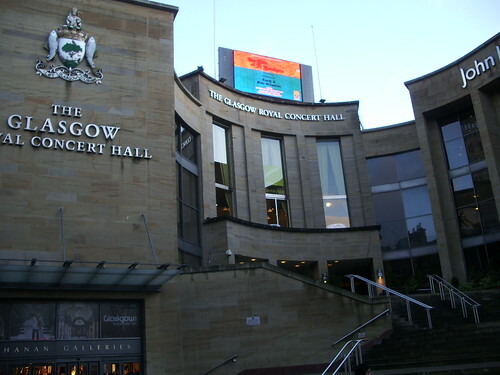 It was actually a functioning market from the end of the 19th century right up to the 1970s, and is now part of the City Halls complex – the Concert Hall next door is the home of the BBC Scottish Symphony Orchestra. As you can see the restoration has kept the character of the market, with many of the stallholder signs still on display. In other news, Lara tagged me last week and asked for 6 things people don’t know about me. I’ve had a job coming up with 6, which I’ve tried to make blog/Scotland-related as far as I could. 1. I first discovered the City Daily Photo Blog networks via London Daily Photo. I still take a peek at that blog most days. 2. 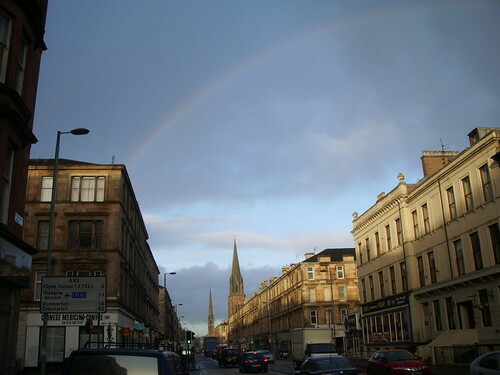 I’ve lived in Glasgow since 2005, when I came here to the University. Prior to that I lived in London for 15 years, and had a proper job! 3. As well as this blog, I also do Sibiu Daily Photo. As part of my PhD fieldwork I spent 3 months there in 2007, and took a million pictures, hence the blog. What lots of people don’t know is that I also spent 2 months in Chisinau, which is the capital of the Republic of Moldova. I didn’t take enough pictures to do a blog for there too (it’s not that kind of place, though I bet if I lived there for longer I’d make a good go of it!). 4. The only Scottish island I have visited so far is Harris (and Lewis, but as they’re 2 bits of the same island I’m counting them as 1) which is where we went for our honeymoon. We’re hoping to visit more this year. We definitely recommend Harris, it was gorgeous! 5. On the first day of our honeymoon (New Years Day last year) I had a comedy fall (fortunately at the bottom of the mountain and not at the top – I slipped over on wet grass about 200 yards from the car!) and ended up on crutches for a week and needed 4 months of physio. On the last day of our honeymoon our car died and we had to get rescued and taken home by the RAC. I’m hoping the next holiday will be much less eventful! 6. Still trying to think of #6! It’s that time of year again – one of the best music festivals in the world, Celtic Connections, and it’s in Glasgow 😀 Last year and (especially) the year before we went to loads and loads of concerts (and spent a fortune), but sadly this year we’re having to tighten our belts a bit. However we did manage to get out on Friday evening to the Old Fruitmarket where we saw Shooglenifty, a great band mostly from Orkney (the guy on the mandolin is from Tasmania I think), who also for part of the set played with an Afghan band, Ensemble Kaboul. What a great night. 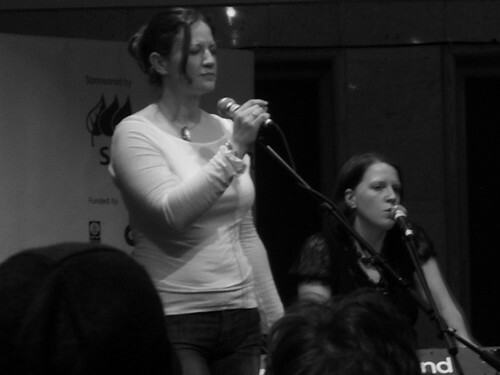 This was the 4th time I’ve seen them, and the 2nd time in Glasgow, having discovered them first at the WOMAD festival in (I think) 1996 or 1997. They describe their music as “acid-croft” which I think is pretty apt – think traditional Scottish music, but with attitude! This is the least rubbish picture I took. In my defence, they moved around quite a lot, I was quite a way from the stage (for locals who know the Fruitmarket, level with the bar), the exposure was several seconds, I was holding the camera up in the air and just holding my breath to keep still, and (possibly most important to the eventual outcome) had had a couple of pints by this point. In the circumstances, not bad! 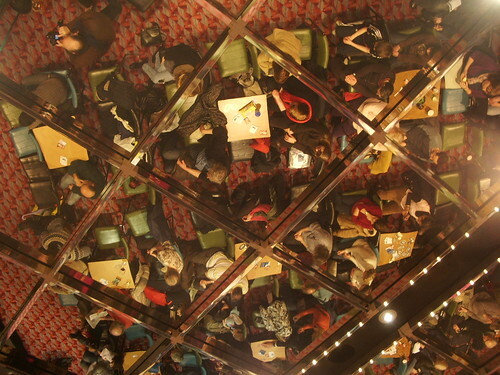 If you get the chance to see this band, go for it – you really won’t be disappointed! 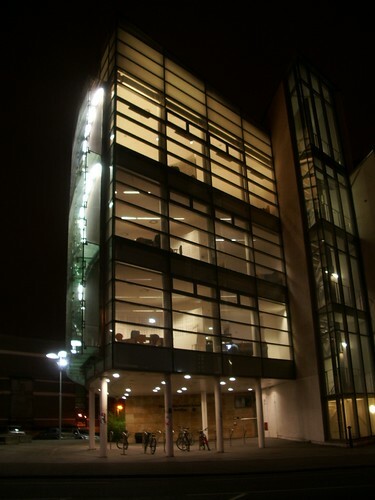 I’ve shown the Wolfson Building, which houses Glasgow University’s Medical School, before. Here it is from another angle. 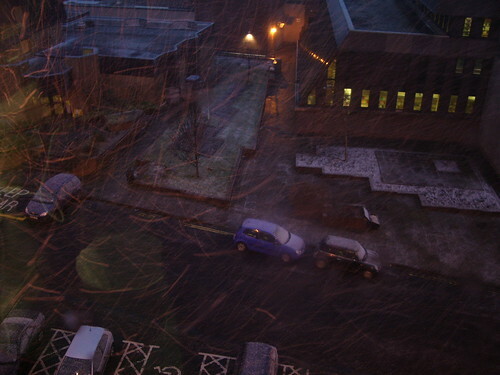 This was about 9.15 on a Friday evening, I was at the bus stop over the road waiting to go home after a meal out. I couldn’t believe I could still see students working in there! On a Friday night! In my day … honestly, the students of today! Shocking! Although the weather has been pretty rubbish the last couple of weeks, occasionally we have had little glimmers of hope. Even though I was late for work, when I saw this rainbow I got off the bus specially so I could snap it. You can see that as well as the rainbow, to the right there’s still an ugly great big raining rain cloud (if you can’t see it try adjusting the screen colours to make the whole thing darker), and after the blue sky another one coming in for the next drenching. The church in the foreground is St Mary’s Episcopal Cathedral and further in the distance Lansdowne Parish Church. Due to their position they often get photographed together.